1. Antioxidant Powerhouse :- The antioxidant containing in horseradish protect the body from mutagens that otherwise inflict grave harm.Research shows how horseradish can decrease DNA damage caused by oxidative stress. 2.It Helps Combat Cancer :- The cancer fighting enzymes are found in horseradish and this can prove beneficial to patients combating cancer.There are other preliminary studies that state how horseradish can induce cell death in the case of colon cancer.All of this only accentuates the possibility of Glucosinolates being used as a potential cancer cure. 3. Enhances Digestion :- The enzymes in the root can stimulate digestion and aid bowel movements. This root is also considered a cholagogue.It stimulates bile production in the gallbladder thereby aiding digestion. 4. Treats Urinary Tract Infections :- The antibiotic properties of horseradish can help treat urinary tract infections in some cases,better than conventional treatment.It works well in this aspect is sinigrin,the compound we spoke of initially.Sinigrin is an effective diuretic and prevents water retention,and this helps deal with urinary tract infections. 5. Eases Respiratory Ailments :- Traditional medicine has seen the use of horseradish root for treating bronchitis,cough,sinusitis and common cold. 6. Fights Inflammation :- Horseradish can help fight inflammation,it achieves this by reducing the release of reactive oxygen species.Several parts of Chinese medicine have recommended the use of horseradish to help prevent inflammation,be it in the case of injury or even for relief from arthritis pains. 7. Helps Treat Melasma :- Melasma is a problem where brown patches appear on the face.Since horseradish has bleaching properties,which can help treat skin discoloration,which is the primary symptom of melasma.You can cut the horseradish in to slices and rub one directly on skin so that the juice of the root is applied to the affected areas,and allow it to dry,then rinse with lukewarm water.Repeat it once a week until the brown patches fade.You may also mix two tablespoon of horseradish powder with one cup of sour cream and apply it to your face ,leave it on for 30 minutes,then wash by lukewarm water.Repeat it once a week until you see positive results. 8. Horseradish has Antimicrobial Properties :-Studies have shown that this compound can offer protection against a variety of microbes,and roast beef added with horseradish essential oil displayed the most resistance against bacterial growth.Horseradish also help in the treatment of ear infections. 9. 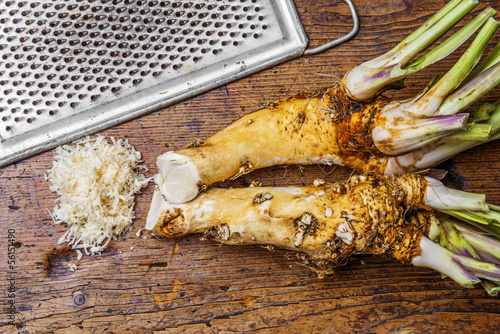 Horseradish Can Boost Hair Growth :- The antioxidants in horseradish help regenerate hair and prevent hair loss.They achieve this by improving circulation to the scalp.Prepare a poultice from horseradish and apply to your scalp,leave it on for about 20 minutes,then shampoo as usual. 10. It Can Help Reduce Age Spots :- The skin lightening properties of horseradish have an important role.You can make horseradish paste and apply it to the affected areas,leave it on for about 20 minutes and then wash it off with lukewarm water.Follow this remedy a few times a week.You also can grate a four-inch piece of horseradish and mix it with a quarter cup of apple cider vinegar.Allow the mixture to sit for about two weeks,post which you strain it.Using a cotton ball,apply it to the affected areas.Repeat this thrice a day for about a month.